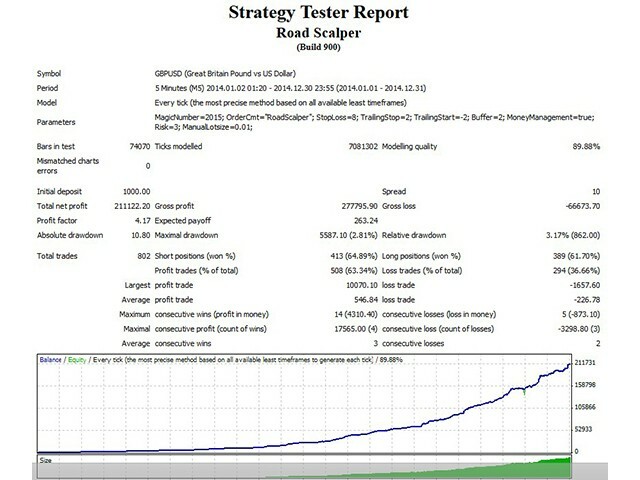 Road Scalper Expert Advisor is a scalping EA based on price movement and some standart indicators. 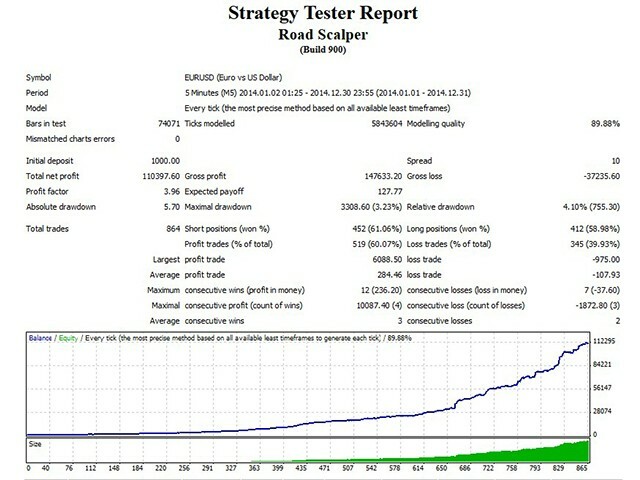 Road Scalper EA does the analysis using data from M1 and M5 timeframes. You can use Road Scalper EA on all pairs, but my recommendation is to use this EA on pairs with low spread and low stop level. Please use this EA on M1 or M5 timeframe. Further details will be provided in the Comments tab. MagicNumber = 2015 - used to identify an order. Stoploss=8 - Stop Loss in pips. 10 is 10 pips. TrailingStart = -2 - trailing start in pips. Buffer = 3 - distance in pips betwen running price and pending order. MaxSpread=2 - maximum spread accepted to trade. It is obvious now this system is fake and probably as other author’s products. Demo strategy tester is misleading giving you sense of great returns but in real life it is far from true. I have attached folder (look for it in comment section) with results on strategy tester and real account over the same period. As you can easily see strategy tester giving you great results but in real time only loses. Keep away from that author as he is very dishonest and it should be reported to MQL5 admin for misleading products. Not good Expert. An Expert with very high loss Potential and the Strategy Test are fake. I Think too early to say final judgement but looks excellent so far. I use on EURUSD and GBPUSD.. I like this strategy.. small loss big profit.. Thanks for Sharing your good job friend..